AccessoriesAccessories: What office would be complete without some finishing touches and accessories? At Integrity Wholesale Furniture, you will find a wide selection of office accessories to give your office a completed look. From keyboard trays to storage bins and much more, our inventory is sure to have everything you need. Our warehouse is located in Cleveland, Ohio, but we serve the surrounding areas like Shaker Heights, Brook Park and other cities in the region. But you can also shop through our online catalog and find what you are looking for regardless of what part of the country you live in. We have been serving the greater Cleveland area for many years and we plan to add to our long list of valued and satisfied customers so be sure to contact us today! If you’re looking for great used cubicle units from Steelcase, then look no further. The used Steelcase Answer 5.5×5 cubicles we keep in stock are in excellent condition. We have over 110 available right now, complete with belt-line height receptacles and a data jack. There is also a 24 inch shelf with a task light built into it. Get a hold of us today to find out how Integrity Wholesale can help you make your office what you always knew it could be! 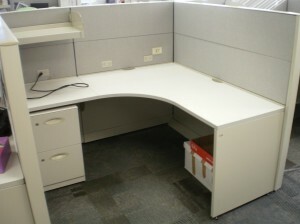 No Comments on "Used Steelcase 5.5×5 cubicles"
Moving and need help with your Cubicle lay-out? Don't know how many cubicles will fit in your new space? Want to know the best size cubicle to support your workers? No worries! Our Designers are ready to help. Send us your .dwg file or a .pdf of the space. Integrity Wholesale Furniture specializes in selling quality Used Office Furniture, Used Cubicles, Used Seating, Used File Cabinets, and Used Case Goods.Headquartered in Cleveland, Ohio, Integrity Wholesale Furniture is ready to work with you on projects, large or small, nationwide! We have 1000's of Used Cubicles from the major manufacturer's in our 64,000 sq. ft. warehouse. Our experienced sales team is waiting to help you with space planning and design, office reconfigurations, installations, liquidations, and more. Integrity Wholesale Furniture LLC also specializes in new office furniture as well as used. We have sold thousands of new cubicles, office chairs, desks, files and more at discount prices nationwide. It is our purpose to supply our customers with the highest quality product on time - every time. Our new office furniture options typically come with a limited lifetime warranty. You can choose the colors, fabrics, options and more to suite your needs.